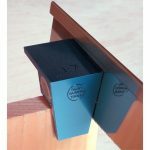 If you are struggling to get a good fit on your dovetails with a handsaw, the Barron Magnetic Dovetail Saw Guide can help. Use the guide as an assist if you are just starting in your dovetailing, or keep it in your toolbox for foolproof angle cutting even when you have your technique down. In the video below, Mike Morton takes a closer look at the Barron Guide, demonstrating how it works and showing us the best way to use it to cut pins and tails on your next set of dovetails. If you have been frustrated in your attempts to cut close-fitting dovetails, try the Barron Magnetic Dovetail Saw Guide, available at Highland Woodworking.